A unique and fascinating small island full of rich history, oddities, and a wonderful heritage, that we at Eco Adventures - Barbados, take a special delight and enthusiasm in sharing with you through our hiking and walking tours, heritage & scenic bus tours, and fishing trips.
. . . A Home to thousands of smart green monkeys. These monkeys' ancestors arrived on the island over 300 years ago, as pets of sailors on slave ships. After many weeks of sailing, well they had enough of each other's company, and the monkeys decided to stay. Did you know they like molasses? Find out more when you see the Barbados Green Monkey on Eco Adventures selected early morning Heritage Trails or the Heritage & Scenic Bus Tours. . . .Scores of centenarians (that's 100 year old) the oldest alive to date (April 26, 2013) is 113. Even though it’s a man, some 80% of Barbados' centenarians are female. Don't forget to ask your guide, what they did to live so very long, when you are on our Eco Adventures Heritage Trails, or Heritage & Scenic Bus Tours. . . .The only Caribbean country that was NEVER invaded by competing colonizers, and remained a British colony from 1627 until its independence. Some Caribbean countries changed colonizers as many as 30 times. Why is Barbados so unique in this regard? Hear it all on the Arbib Heritage & Nature Trail, along with the other unique aspects of our heritage. . . .Coucou, Flying Fish, Mauby, Sorrel, Pudding & Souse, Dunks, Sugar Cakes, Fat Pork (a fruit), Tamarind Balls, Guava Cheese, Conkie and Coconut Bread. Book your Eco Adventures Heritage Tour today, and taste Barbados, any of the above, our foods, beverages, fruit (seasonal), and sweets. Buy 100% Barbados, John Springer Chalky Mount Clay Products, after seeing his amazing clay spinning & moulding demonstration. It’s all part of our Barclays Park/Chalky Mount Trail, and Heritage & Scenic Bus Tours. Hear and see how Barbados came into being. 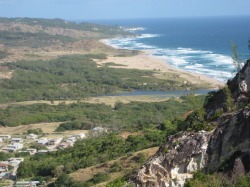 Our article entitled " Barbados Is Much More", is now featured in the EzineArticles.com directory.